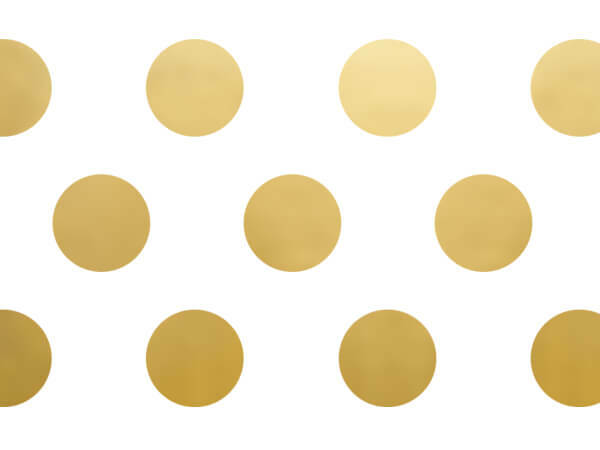 Metallic Gold Dot tissue paper feature large metallic dots printed on white tissue paper. Fun look for Christmas and all year long. Tissue Paper by the 240 sheet bulk ream is printed on 100% recycled paper and part of our Green Way ® Eco Friendly Packaging. Made in the USA. Dot Printed Tissue Paper gives a simple bag style, adds pizzazz to boxes or makes a simple wrap by itself. Made in the USA in a rainbow of colors to choose from. Most Dot prints are now 100% recycled. All tissue prints contain a minimum of 20% recycled material. Sheets are 20x30". All Tissue Prints are offered in reams.